This past Sunday, I started the day with a cup of coffee and a porch sit. Of the many things for which I am grateful in the new house on Burlington, one is that it has a great front yard full of trees, a pastoral feel in the midst of the city. The house is quickly becoming a home. With no agenda, I settled in and quieted down, without and within. Fairly quickly, I became aware of a symphony taking place all around. The birds in my neighborhood were up early and whistling a tune. Whereas I could not see most of my feathered friends, I was amazed by the array and diversity of the songs (with even a rooster thrown in!) Listen here, http://bit.ly/Oct08birds, for a brief, 1-minute recording that I captured of the experience. In the stillness of the morning, their canticle was almost inescapable. Therefore, I began to wonder: was this an out of the ordinary experience? Or am I regularly missing out, in my busyness and rush, of such a wonderous and beautiful opportunity? A few feet from my chair, I noticed Francis. 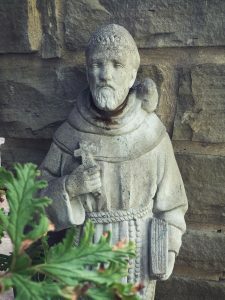 Early in our marriage, Laura gifted me with a small, garden statue of the saint. In one tale in his biography, Francis preaches to a flock of birds. Hence the usual bird on his shoulder. Now I’ve been known to preach some pretty wild sermons in some pretty wayward places. But I knew immediately that I was not the one delivering the message, but the recipient. There was something that I needed to hear. And so, the birds and their songs (and God) had my attention. What was their message? …Sing! Fly! Lighten up! Be free and grateful! Look at the birds, free and unfettered…careless in the care of God. And you count far more to him than birds. Thank you, birds. Your word to me was perfect! How does busyness keep you from everyday joys? What gifts from God escape your awareness? Where in your life do you long to “sing” and experience the lightness of the birds?